Have you been thinking about getting a solar installation on your home? Firstly, what you should know is not all solar power products are created equal. There are a lot of big national companies that offer cheap inferior products for a quick sale. VE-Electrical is a full service solar installation company, that we means yes we do solar installation, but we also repair, service, upgrade solar systems. We have and do see a lot of installations performed by contractors and have seen a lot of solar panel and inverter brands that are of inferior quality and fail. Solar systems are NOT created equal, in solar quality Matters!! And if you were being tempted to choose one of those cheap and nasty packages, please read the fine print! A lot of those ‘quick sale deals’ have this tiny fine print that the product can be substituted for something else if what they have nominated is not available! Make sure you are going to get what you think you are signing for…. or better still ask the salesmen if they’ve ever installed a solar system? Ask they why they’re picking that brand and product? Do they have it installed on their home? What independent reports do to they have to show the performance of those panels and inverter? VE-Electrical salesmen are ELECTRICIANS, so in fact we don’t call them salesmen, we call them Expert Solar Electricians! 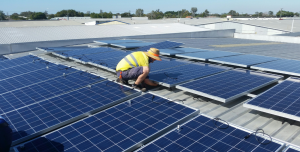 Our Solar Electricians have installed, repaired and serviced many systems. We only sell solar panels and inverters that we use in our own homes! Using solar energy is a great way to save money and add value to your property, as well as reduce your environmental impact. We’re different to other companies, because we consider every property is unique. We’ve learned from experience that to get the best from solar, you need a system that’s designed specifically for your needs. There are many factors that impact how effectively solar panels can generate electricity. And how much money you can save! VE-Electrical, Air Con & Solar is certified by the Clean Energy Council, so you can be confident that our advice is industry best practice. We pride ourselves on honesty and clarity in all that we do. We won’t proceed with an installation unless we believe solar is the best option for you. This is sometimes the case due to roof position or shade, which prevents a solar system from performing well and delivering good value. Contact us now, and book your personal design quote! Here at VE Electrical, we believe in reliable, professional and personalised services, fit to your needs. We're a small business based in Northgate and the Redlands in the Brisbane area. If you need a helping hand, just give us a call.